One man's attempt to throw nothing "away" for a year... and beyond. 8.2 Things You Can Do! Click here if you are interested in having Sustainable Dave come speak at your school, business, or religious institution. The Answer To Plastic Water Bottles? My friend Joey came over today and we shot a quick little overview to vermicomposting or worm composting. Sorry it took so long, but here it is in all it's rushed glory. I figured this was a better way to communicate right now than typing as the ear thing makes it hard to concentrate for too long. I'm no expert but glad to share what i've learned so I hope this helps a bit. Fascinating video! Thanks for making the time to do that! I've been wondering about keeping worms, but right now we feed almost all of our kitchen scraps to our chickens, and paper goes to recycling. I'm very tempted to try the worms, though, for the fertilizer (I have a big garden) and because I think tbe worms and the process are cool. Ok that seems kinda do able. I think I am worried I might just mess it up somehow and the whole thing will rot. I used to do a form of composting that consisted of digging holes and putting all the food scraps in it. You could even put meat and dairy and the worms would take care of it. It also brought tons of worms to a formerly worm free yard. 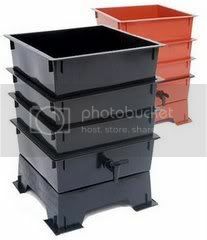 The worm bin is good for the winter when it is too cold to dig holes. I am going to get a wrom bin. thanks so much for the video! caught this video off the vermiculture list. Funny, I thought the blog looked familiar, and it was because I'd heard your NPR interview. Your worm bin is looking good! Before my worms all succumbed to the summer heat last year, I was doing the rubbermaid thing... I like the Worm Factory quite a bit. Wow - I've been working with my worms - I have the same bin - for a couple weeks. Your video answered a lot of questions. Thanks! Glad it helped out Sandra. You should check out that worm composting yahoo group as well. Some wicked smaht folks over there. Waiting for my worm order to arrive and in the meantime, I am obsessing over doing this right. Your video was a great help. Can't wait to get started. Awesome. Let us know how it goes. We're coming out with a new composter that looks like a terracotta urn. What do you guys think? ok dave, i've taken the plunge. bought a farm and am switching to worms! thanks for this video. i'm much more at ease about making this change having seen it. So you;ve bought the farm so to speak (I couldn't resist). Congrats! Enjoy them and sing to them often! So what do you do with the meat scraps? Also, for those who live in tiny apartments in NYC, would you recommend leaving those bins out in the balcony (through summer & winter seasons)? Check out this post http://365daysoftrash.blogspot.com/search?q=meat+scraps for the meat scraps question. AS for city dwellers, 40-80 F is pretty much the range so i'm afraid NYC may not work for that. Boiler room maybe? i was taling with my wife about it, and we're thinking of going forward with this. 1) do worms escape and end up dying on the basement floor? if so, how many? 2) do house centipedes eat worms? we've heard they eat other insects and we don't kill them in our basement. but we also don't want a population explosion of them because of the worm feast to be had. 1) Basically they should never escape if you tke care of them. The escape I had was due to mixing up the PH when i harvested castings and now i know to leave a light on for a while then and they'll be fine. 2) Don't know about the worm/centipede thing but y guess is that if they didn't get along well, they'd stay out of the worm bin. I doubt they eat worms, most bugs don't. Great video! I've been worm composting for almost a year now (in a small apartment, different system than yours) but have never fed them cooked food. You mentioned adding rice, and obviously your worms are doing okay with that so I might give it a try. Do you have any knowledge as to why books recommend not giving them cooked food? Hmmm, hadn't heard of that. Only ting i cna think of is salt and whatnot? What are you using in your apartment? We have one large plastic bin, with air vents in the sides and holes in the bottom for the *tea*, all covered with a plastic lid. I did a city program where they provided these, the worms and a workshop for $25. I love the idea of the sieve trays where worms can travel freely! Seems like it'll be less work in the end. I'll do the first *harvest* in a month or so, and will probably set up a second bin at that time. I think they suggest no *cooked* food to help with any odors (city folks/apartments, etc.). We haven't had much problem with that so i may introduce some cooked food (no meat) and see how it goes. Interestingly, we did toss some broccoli sprouts in a while ago and them worms never touched them. I think this may be because they sprouts were still growing, and not decomposing, but not sure about that. I was wondering do you have to do anything special when putting the food in for the worms? or can is just toss it in? Not too much. Chopping it up will allow them to eat it faster and covering it with newspaper will keep the bugs down, but essentially yes, throw it in. Nice video. Worm compost is to compost as compost is to soil - it is the best. When you toss in your scraps, cover with more cardboard and wet it down. heyy, im a 13 girl year old trying to do my best with this whole worm thing but lately it hasnt been going well. First off i had to collect my own worms!!! It was really funn actually. But it grossed out my mom alot! but by the end of the night she was a pro! Well anyways i put all the worms in a bucket and put newspaper and sprayed the newspaper to keep it moist. I left it like this for a while and came to find my worms died!!! I think it was because they overheated and were in a small space. Can you help me please!!!??? Dave, apart from heavily admiring your techniques, I absolutely love your sense of humour! I got your email as well and tried to email back but it bounced. Sorry about that. As far as what went wrong, could be a few things. My first suspicion is that you may have gttent he wrong type of worms. Other possibilites - did you put in paper or shredded paper? They need the shredded stuff so they can eat it. Air is key as is heat/cold. Check out the book Worms Eat My Garbage, but most importantly, DON"T GIVE UP! Email me if I cna help any other way. So, all of your talk about worm composting on this blog has made me start thinking about doing it. However, while thinking about it, I realised that I throw out almost no food waste! The only thing I do regularly throw out is bread (I live on my own and never manage to eat a whole loaf of bread on my own in 3 days. I want stores to sell half loaves of bread). Normally if I have something left over after a meal, I store it and eat it the next day. So I would like to know how much you have to be able to feed these worms so that they don't starve. I have this horrible image of going to throw something in the bin and having no live worms left because I'd starved them all to death! You could easily feed them a diet of shredded paper and cardboard and they'd do fine. That said, you must have veggie peels and fruit cores from time to time no? Not very often, actually. This is a combination of diet choices and eating some pre-packaged foods. I eat the skins on most of my fruits and veggies, with citrus and kiwi being the main exceptions. If the skin's not toxic and doesn't have a horrible taste or texture, I eat it. Even the skins on things that we normally peel, like potatoes, are perfectly edible (so long as you scrub them first). Also, I'm allergic to apples and only have pears infrequently, so there aren't a lot of fruit cores in my trash. I do get pits fairly often from plums and nectarines, but I kind of doubt that a worm could eat them. They're just a wee bit hard. Thanks for answerring so quickly. I was into composting here in the Phil many years ago. But my worms escaped when I turned off the light at night. Electricity is costly. So what is my alternative so they will not escape? Probably the worms cannot climb out if the bin is made of smooth plastic as in your worm bin. Bins then were made of wood. I would like to get back to vermicomposting since i accumulate so much garbage due to juicing of vegies and fruits. Love your blogs. So where can i acquire a worm bin? If your worms escaped then there was a problem witht he bin. Did it smell? usually it's either too much water, not enough food, or a variety of both. Generaly speaking if the bin is well maintained they won't want to leave. I'm about to start offering the bins through the site but am not up to speed yet. If you'd like to contact me through the contact tab up top, I can probably get you a bin. hey dave, thanks for the video, i was wondering, do you know if composting worms could survive on a diet that is almost exclusively coffee grounds? i own a small, sustainably oriented coffee shop and would like to compost my groundswith worms, any advice? INteresting question. They would need some fiber too (shreded paper works great) and they may get hopped up and keep you awake at night (hah) but worms tend to be pretty easy going. Give it a shot. I'd bring some scraps of other stuff from home to throw in there as well. The only thing I'd be worried about is the high acid content. That said, they most likely wouldn't die, they'd probably just try to escape and look for food. So bottom line is give it a try and keep an eye on them. Let me know how it goes too. Hi, I have lived in Iceland (was born and bread in Glasgow, Scotland) for 17 years in the capital city Reykjavik and moved to a small town about 4 years ago. We have a large garden and inherited with it lots of blackcurrant and cranberry bushes, rhubarb and a potato patch. I have been throwing all the rhubarb leaves, clippings, weeds and household organic waste, coffee grounds, egg shells, fruit peels etc. into a corner of the garden, hoping to make compost. Currently it seems to be just a big hard pile, I have not dug through it to see what lies beneath. Being brought up in a city, I have no idea about growing things. I have heard that you should not grow the same crop in the same area for more than 3 years, but should do crop rotation. In Iceland, growing potatoes is a big cultural thing. Problem is the potatoes are so small, biggest being about an inch in diameter. My Icelandic husband says that that is the normal size for Icelandic potatoes, but I think that using the same land to grow potatoes for 20 or 30 years, must be draining the nutrients from the land and causing the potatoes to be so small. I am hoping to fold in some of my "compost" in the spring. Do I leave it for some weeks after that before planting or should I let the land go wild for a year to recover? Or plant other veggies? I really enjoyed watching your video about the worm factory and would love to have one. How much do they cost? Can they be shipped to Iceland? Do worms come with the "worm farm"? If so, I don't think they would be allowed into Iceland. There are very strict policies about importing wildlife, especially non native. So, can any kind of worm do? I noticed the worms you showed where quite small. Icelandic earth worms are quite big. I can buy lots of earth worms here as they are sold for fishing. Sorry that took so long. It got lost in my email. i don't know what kind of worms you have, but the best way to check is dig some up, throw them in a bucket with dirt and some food scraps (no citrus) and see what happens after a month or so. Make sure to keep it moist too. If the worms are good and the food is gone, you're good to go. I see that you have color paper in the bin. I've searched and found that I could put in news paper with color ink but can I also put other paper with color inks in it also, as long as I stay away from the glossy papers? Hi there! I'm a newbie worm enthusiast (and I mean I'm so excited I think about my worms all the time). For now though I'm just using a bucket. I don't think the high tech stacked worm farm is available in my area, but I'd love to give that baby a try. Generally speaking yes, but less ink is always better. Speaking of meat, has anyone here tried vermicomposting meat? I'm currently giving it a try using some chicken bones and skin. I'm not sure if it'll work out. It'll be great to read some of your experiences!